When we heard that John Galliano had been hired as creative director for Maison Martin Margiela we were very excited because he is, after all, one of the most ingenius designers alive today, and we have ALWAYS loved Margiela. 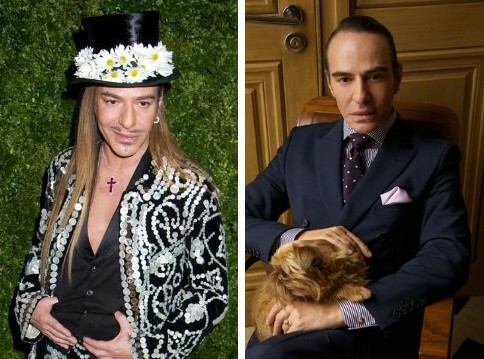 After that anti-Semitic rant that got him rightfully fired from Dior in 2011, Galliano had extensive rehabilitation treatment for drug and alcohol abuse. And he SOUNDS like a different and more thoughtful person. But when we saw the current photo (upper right) of him released by Margiela with the announcement, we GASPED! Has Galliano had a lobotomy or shock therapy? He looks like an entirely DIFFERENT PERSON! Has he lost his edge?Hopefully, he still has some creativity left. George Clooney Is Suing French Magazine Because Photo Reveals His Dad Bod – Not Babies’ Faces!